Erfurt Cathedral is the most beautiful Church in the City and it is unique in Germany. 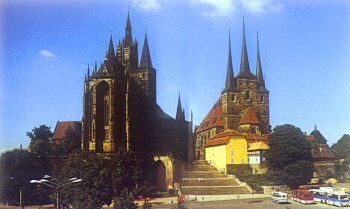 St. Mary's Cathedral was and is Thuringia's main Catholic Church. After World War II, it attracted many Pilgrims and after Germany's reunification, it became Diocesan Church of the Erfurt Bishopric.